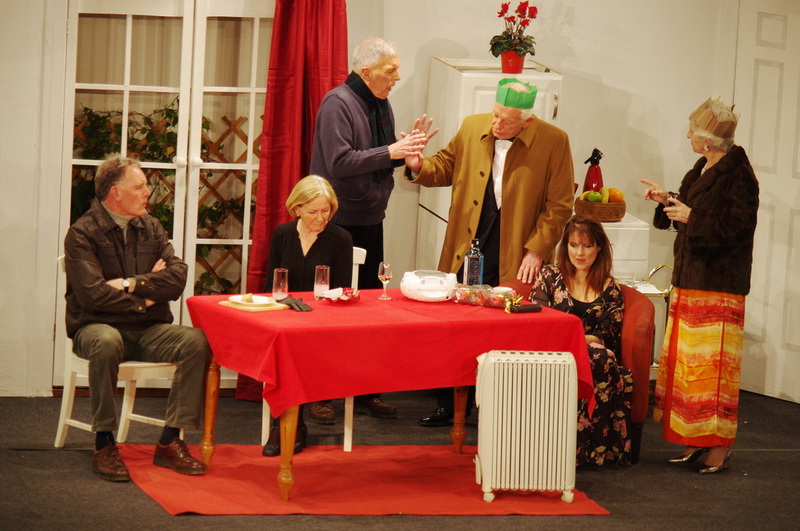 Jenny Robb’s Review of Crieff Drama Group’s Production of ‘Absurd Person Singular’ by Alan Ayckbourn. Alan Ayckbourn’s Absurd Person Singular, performed by Crieff Drama Group last Thursday to Saturday was a real treat. It was extremely well cast with a strong team of six actors providing a well-balanced and most entertaining show. This play has a reputation for being very funny and there was certainly plenty of laughter from the audience, but beneath this is a dark, almost savage theme. At no time did the cast play for laughs but kept to the truth of the play which is what made it so funny. The play takes place in the kitchens of three couples over three consecutive Christmases, past, present and future. The rest of the house is authenticated through the unseen Potters’ offstage raucous laughter and the barking of Geoffrey’s ferocious dog. In act 1 we meet Jane and Sydney Hopcroft played by Ann Morrison and Mike Owens. Sydney, a contractor, is desperate to climb the social ladder and impress his guests, architect, Geoffrey and his wife, Eva Jackson, played by John Cummings and Helen Day and banker, Ronald and wife, Marion Brewster-Wright played by Tom Inglis and Janice Bourelle. Poor, bullied, Jane frantically polishes her already spotless, white kitchen to pluck up courage to meet her guests only to discover she is still wearing her slippers with her shoes left on the mantelpiece in full view of her guests. She then discovers that she has not ordered enough tonic and decides to brave the rainstorm to buy more. There follows a very funny little episode where she dons wellies, raincoat and hat before leaving the kitchen through the French windows. Ann Morrison made the most of this lighter moment much to audience amusement. Act 2 takes place in present time in the Jackson’s kitchen. Eva has already established her addiction to anti-depressants possibly caused by her philandering husband but by act 2 she is seriously depressed and tries through a variety of methods, each of which is inadvertently foiled by the others, to commit suicide. Helen Day played this scene extremely well never faltering from her depression despite the laughter. Husband, Geoffrey meanwhile confident and buoyant in act 1 has had a design disaster and John Cummings caught his beginnings of doubt just right. Act 3 the kitchen of the Brewster-Wrights where all is not well. Ronald’s banking prowess has collapsed. Tom Inglis made a well-crafted character change from comfortably self-satisfied to worried and shaken while Marion, wonderfully portrayed as very attractive but scornfully snobbish by Janice Bourelle, has become sarcastic in the extreme. The arrival of the Jacksons shows Geoffrey now without work and Eva who appears to be undergoing a recovery. Finally the successful and wealthy Hopkins arrive and the audience much enjoyed watching Mike Owens revel in Sydney’s almost sadistic pleasure in being able to lord it over the others.